← T-Mobile To Get HTC Incredible? let’s see what’s the best choice on may 8th. Sweet. My wife gets to renew, and I get yet another new phone to mess with. Hd2…here I come. Is there anyway to get only one data plan for this? I want a HD2, my dad a Blackberry…but he lives in a place where it’s still GSM, so a data plan for him would be useless. pssst…get the phone, slip the SIM into a non-data phone, like a Razr, make a call to register it on the network, log in to T-Mobile’s website, and modify the features on your account, to get rid of the data plan. It’s worked flawlessly on the two Fenders in our family that never leave sight of WiFi. No matter what customer care tries to tell you, the smartphone requirement, as it is currently worded in the contract, is UNENFORCEABLE! For it to be a valid requirement, per FTC/FCC (not sure which one it was) guidelines, there must be a way to bail out…they could even say there’s a $5,000 termination fee..but they don’t, so the “requirement” is bogus. You must, however, activate the data portion when you order the new phone, so you might get stuck with a few days of prorated charges. I thought most people were on Even More Plus now? Which would mean this deal is worthless. Why do they keep extending this deal? Either they are trying to make it appear to be THAT MUCH in demand, or not enough people are buying it single. 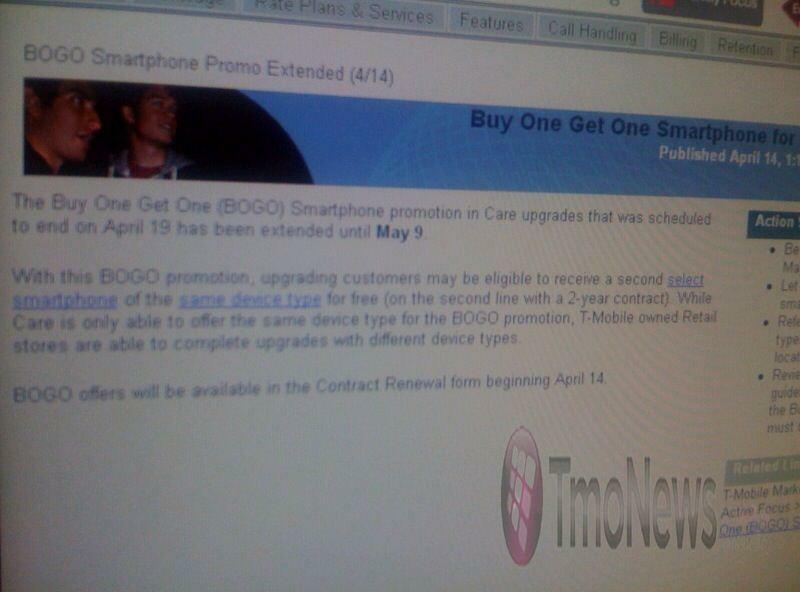 Call your local tmobile store before going in for the BOGO, our store is not doing the BOGO past the 19th scheduled end date, although customercare will for sure have it till the 9th of May. Just a heads up. Woohoo! I was wrong! Went to a T-Mo store, and walked out 4 minutes later with two Cliq XTs for the price of one! And I’m on Even More Plus, so I got to finance the one I did buy! $16, and I walk out the door with $660 in phones! Yay! !